millfields: walthamstow reservoirs: cross about Crossrail 2 proposals? walthamstow reservoirs: cross about Crossrail 2 proposals? 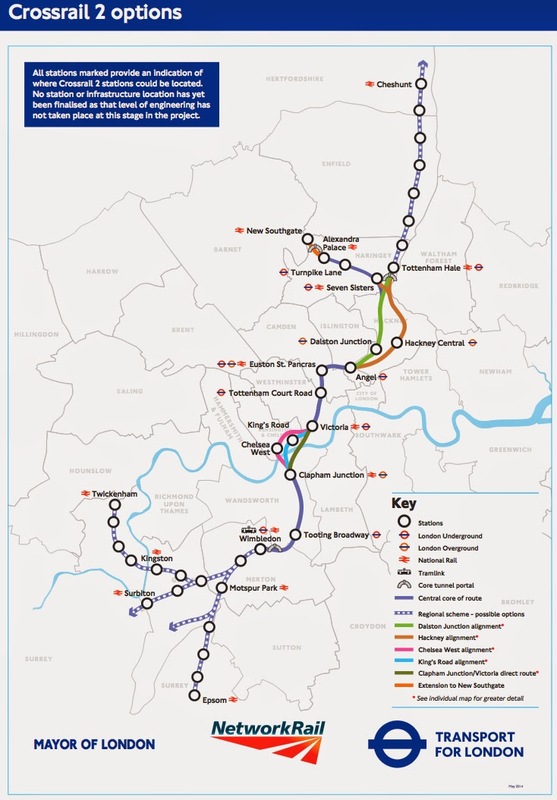 Crossrail 2 will deliver essential transport links and help to transform the economy of north east London and the Lea Valley, but at what cost? Just at the moment when the Reservoirs are to be transformed into a unique wetlands habitat, a new railway line will slice them in two with a new tunnel entrance emerging between the Warwick Reservoirs. Existing tracks through the area will be doubled from two to four tracks running alongside Walthamstow Marsh, between the Warwick Reservoirs, past the corner of Markfield Park, over the River Lea, and up past Yarmouth Crescent and Jarrow Road into Tottenham Hale. Why is the current consultation documentation stopping short of spelling out these consequences? A consultation on the plans runs out on 26th July. TfL say they will consult again after they have decided how the railway will travel through the Marshes towards Tottenham Hale. This is the wrong way round. Local people deserve to be consulted on the range of options and to fully understand and comment on the implications before a decision is made. The likely current scheme (current plans are vague) with the tunnel emerging between the Warwick Reservoirs, travelling over the Lea on a new bridge and then above ground to Tottenham Hale. A tunnel entrance between the River Lea and Tottenham Hale (i.e travelling under the Marshes, the Reservoirs and the Lea). The impact of this option on the surrounding residential neighbourhoods needs to be fully understood. A tunnel under the marshes and reservoirs and under Yarmouth Crescent and Yarrow Road with a new lower level station at Tottenham Hale. The line would then emerge between the Victoria Line sidings and Northumberland Park, north of Tottenham Hale. We think local people concerned about the potential impact on the, Marshes Reservoirs and local built heritage and residential neighbourhoods should argue strongly for the third option. We also need to fully understand how these options affect the possibility of a new Crossrail Station at Clapton and what that means for the locally listed station building and the surrounding neighbourhood. This may ultimately prove to be a poisoned chalice. Finally, we need to understand the construction impacts. Where will the main construction sites be located, what routes will the spoil lorries take and where will tunnel access and ventilation shafts be formed? TfL have a long established desire to run a 15-minute frequency all stations service up the Lea Valley from Stratford at least as far as Brimsdown. The rail corridor up the Lower Lea Valley was once very wide with continuous freight loops and many freight and carriage sidings but a lot of this land has since been sold off. TfL want a third line put in from the site of Lea Bridge Junction to Brimsdown. Network Rail has offered a third line from Tottenham Hale to Angel Road. There is railway land available to support this including at Tottenham Hale but following land disposals the station site IMO is now a bit too constricted for a 4 or 5 platform surface station. If Crossrail 2 tracks are on the surface they could use the triangle of land between Tottenham North and South Junctions and South Tottenham East Junction to descend into tunnel. Demand for Lea Valley Line rail services is increasing, Stansted Airport has wanted 4 tracking for years, so it is quite likely the Crossrail tunnels will have to start before Tottenham Hale although then they will have to dive under the Victoria Line tunnels.